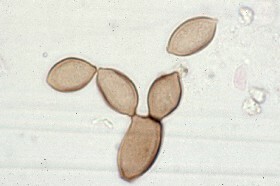 Spores of Cladosporium usually are formed in long branching chains. 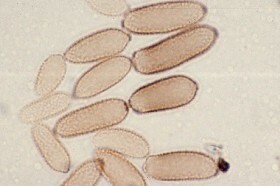 The shape of the spores varies from spherical, to barrel-like, and to lemon-shaped. The spore surfaces are marked by a texture ranging from smooth to minutely roughened to highly "warty" wall. 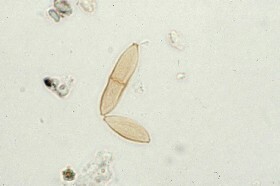 In most places in the world, spores of Cladosporium are the largest contributors to the atmospheric spore count, both indoors and out. 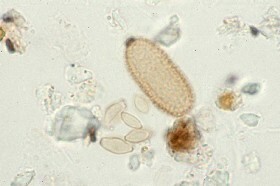 Although these spores are present year round, their concentration in the air hits a peak in the summer and early fall seasons in temperate climates. 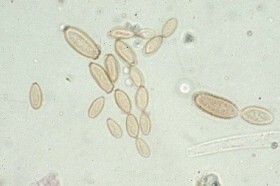 The spores are known to be prevalent sources of allergens in the atmosphere, generally causing symptoms associated with respiratory allergies. Symptoms include allergic rhinitis (hay fever), asthma, and hypersensitivity pneumonitis. 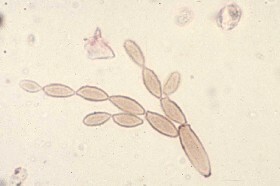 Spores and colonies of Cladosporium are known to be very resistant to changes in the amount of water available, as they have been observed to resume growth after extended periods of drying.